Key Difference: VPN, short for, Virtual Private Network, is a network that protects private information being sent over a public telecommunications network. APN, short for, Access Point Name, protects confidential information being sent over a public telecommunications network. 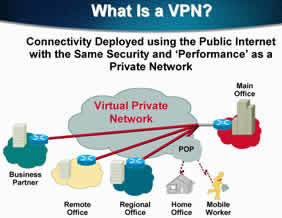 VPN (Virtual Private Network) and APN (Access Point Name) are two different ways for people to exchange data over a network. VPN, short for, Virtual Private Network, is a network that protects confidential information being sent over a public telecommunications network, such as the Internet. It shares the network that sends or receives data which is directly connected to the private network. In short, it provides an encrypted link between the points or networks. It basically provides the networks a direct contact with the public network. A common example for VPN is the company networks, which use a router to create site-to-site links or link a PC so that the employees, regional office, head offices, etc. can secure and manage policies of the private network and manage many others functions. APN, short for, Access Point Name, is the name of a gateway (that may contain devices such as protocol translators, rate converters, signal translators, etc. to provide system capable of being operated reciprocally) between a GPRS, that is a mobile data service on the 2G or 3G mobile network and another computer network, often the public Internet. In short, it protects confidential information being sent over a public telecommunications network. It is used in establishing the packet data network, most commonly used over the 2G or 3G networks. A network that uses the internet to transfer information using secure methods. It protects confidential information being sent over a public telecommunications network. VPN works over an existing public network, and only works if the user has another means of connecting to the Internet. An APN directly connects users to the Internet. It also allows connecting to the external network with which it is associated. It may be possible to connect to a VPN from a mobile if it supports the action in phone and if one knows the detail such as server name, account and password. APN is a unique network that must be programmed into one’s cellphone before he can connect. VPNs are mainly designed for the transmission of confidential information. APNs are designed for the wireless provider. It is planned for the transmission of confidential information, such as email, over a public communication network. It determines a level of safety on the wireless provider. If one have a custom APN, he is responsible for configuring the level of safety.